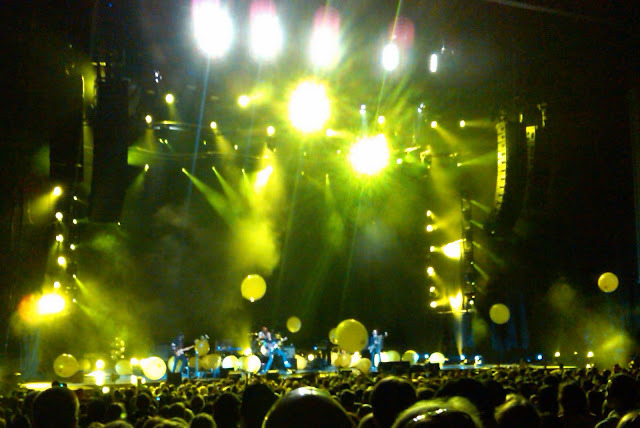 Coldplay - Yellow from the Viva La Vida tour tonight at the Verizon Wireless Amphitheater in Virginia Beach, Virginia. Great show, the band was awesome. Blackberry Storm Camera Phone, I was the only one who didn't carry a camera or video camera in. OKay, now I am jealous! Coldplay will never come to Fort Myers! Plus, you took a better picture wiht your blackberry than i do with my regular camera! This was by far the best of the lot. Most were just blurred. Photographers secret - take a lot, one is bound to turn out.